According to Nielsen’s Q2 2017 Comparable Metrics report, released in December 2017, the amount of time we spend watching online video increased on all connected screens over the last two years. However, the number of people using the tablet and PC to consume video declined over the same period. Nielsen includes streaming media players, game consoles, and connected DVD/Blu-ray players in its accounting of connected TV use. Penetration of connected televisions has increased steadily between Q2 2015 and Q2 2017. In 2015, 40.7% U.S. adults watched at least 1 minute of video on one or more of the connected TV devices. That increased to 46.9%, or 115.2 million people, in 2017. 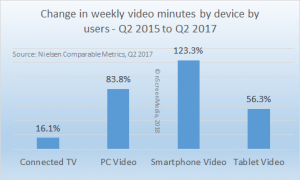 Connected TV users also steadily increased viewing time through their device of choice. In 2015, users watched 1 hour and 4 minutes a day, increasing over 10 minutes in 2017. Penetration of TV-connected devices is deepest among people in the age range 18 to 49 years. Millennials (18-34-year-olds) spend the most time watching video on their connected televisions. 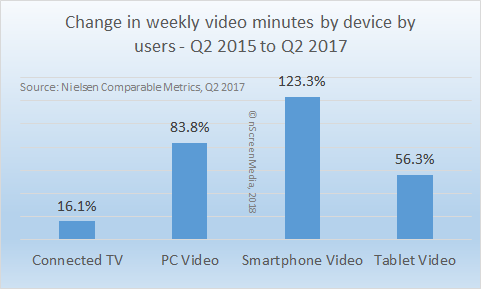 Those watching at least 1 minute of video per week on their PC declined from 34.7% in 2015 to 29.1% in 2017. Video mirrors the general decline in PC usage. However, those watching video on their PC increased their viewing sharply. 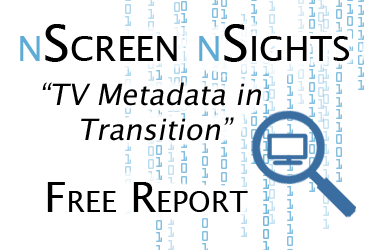 In Q2 2015, PC video viewers watched about 37 minutes a day. Two years later viewing has increased to 1 hour and 6 minutes day. An impressive gain for a device that is in decline. The PC is most popular as a video platform among the 35-49-year-olds, though a smaller number of millennials watch for longer on the device. Those watching video on their smartphone increased from 37% in 2015 to 52% in 2017. As well, the amount of time spent watching on the device by smartphone video viewers more than doubled, to nearly 14 minutes a day in 2017. The aggressive bundling of video services with mobile plans from operators. Expect both these factors to continue to drive the adoption and usage of smartphone video for the rest of 2018. People in the age range 18-49-years prefer the smartphone, though millennials watch far more than any other age group. Since the device’s introduction, the tablet has consistently grown as a video platform. That changed between 2016 and 2017 when tablet video users declined from 21.4% of the U.S. adult population to 20%. Interestingly, the tablet’s use for social networking also decreased slightly, though app and web use on the device increased slightly. As with the PC, though the penetration of video users of the device declined, usage increased. In 2015, tablet video users watched around 9 minutes a day, increasing to 14 minutes a day in 2017. The tablet is also used most by 18-49-year-olds, though half as many use it as the smartphone. 35-49-year-olds watch the longest on the tablet, matching their consumption through the smartphone. We continue to watch more video through all the screens in lives. However, fewer people are using the tablet and PC to watch video in 2017 than in 2015. Smartphone and connected TV continue to grow in adoption and usage.